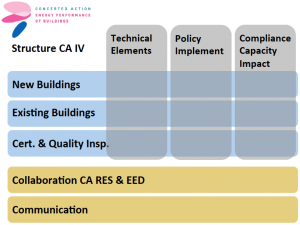 The Central Teams cover and address issues that support coordinated implementation of the EPBD to increase its impact and reduce implementation costs, focusing on issues that do not require harmonised national implementation methodologies. Collaboration between the Central Teams will be a common operational modus. Each team is led by a Central Team Manager appointed among the partners. Internal and External Communication, Peter Wouters, CSTC. The Central Team Managers together with EASME and other central functions form the Steering Group. This group is responsible for the set up of the work on topics and for the Plenary Meetings in the CA EPBD IV. The Danish Energy Agency is leading the CA as the overall CA IV Coordinator. The CA IV Topics and Themes are addressed in sessions during the Plenary Meetings, collaborations between meetings and possibly during a working group.